Food is fuel, whether you are talking people or dogs and the greater your fuel needs, the greater you need for both more and higher quality food. Now, I’m not going to write an article that is an advertisement for those $1 or even $2 per pound dog food out there. Some of them are worth what they are charging for them and some of them aren’t worth much more than the cheap stuff you can buy at the local grocery or feed store. First, let’s take a look at the ingredient list on your dog’s bag of food. For your hunting dog to be getting the nutrition he needs the first ingredient should be chicken, lamb, or (if you are feeding one of those outrageously high dollar dog foods) something like buffalo, salmon or duck. What you should not see is corn or meat-by-products. Corn is practically indigestible for dogs, at best it will make them feel full so they don’t eat their dog house or the other dogs. Meat-by-products are often things like ground up chicken feet or pig intestines and other things that the meat industry needs to figure out a way to get rid of after they’ve pulled the “good” meat for your local grocery store’s meat market. And the word “meat” is not very reassuring either since the makers of the dog food who list the term “meat” don’t really seem to want you to know what kind of “meat” they are using. I mean, for all I know, their “meat” could be making my dog a cannibal … Probably not, but why take the chance. There should also be enough of the high-quality meat in the dog food to give it at least 20% protein. Less will not give your hunting dog the nutrients he needs to be in top form. Crude fat should make up another 10% (again, this is a minimum). All dog foods use some type of filler, but some are better than others. As I said earlier, corn is pretty worthless as far as nourishing your dog. Oatmeal is much better, so if your dog’s food uses oatmeal as a filler, it gets extra points. 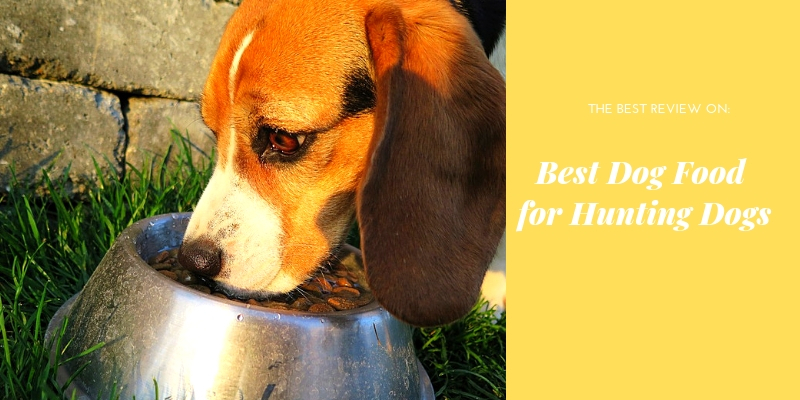 Many dog food manufacturers have begun adding fruits and vegetables and these are also something you want to look for to make sure your dog is getting a well-balanced diet from his food. By reading the ingredients list on the bag, you can find out quite a bit about whether or not the kibble your dog is getting is going to give him what he needs. But there are other factors involved in feeding your hunting dog, as well. Since food equals fuel, when the dog is actually working or hunting, his caloric needs are higher than when he is just laying around. That means you need to increase his kibble in direct proportion to the increase in his activity. But energy isn’t the only reason your dog needs good, quality food. The better his diet the easier it is for him to develop muscles, grow a thick coat and stay warm in cold weather; even injuries will heal faster if the dog is well nourished. Even if he is not working, during cold weather your hunting dog needs more food than in the summer – for every 10 degrees Fahrenheit the temperature drops, your dog needs about 7 to 8% more food. Given that many times the difference in temperature can be as much as 30 to 60 degrees colder in the winter than in the summer (or more), you are looking at a dog that needs between a 25% and 50% increase in what you should be feeding them. You don’t want to make the dog fat, but a little tiny bit of extra “padding” isn’t going to hurt and it will help them keep warm. Another thing, be sure the dog gets adequate water. Water not only keeps them hydrated, but it helps them digest their food and utilize the nutrients in it. Adding some warm water to their kibble is one way to make sure that the dogs are getting enough to drink. When my dogs are being asked to expend extra energy or are sick and need a boost, I feed them what we call “puppy primer” (not that ANY of my dogs are puppies – most of them are 5 to 10 years old). Basically, it’s about 1-1/2 lbs of chicken or beef liver, thrown in a pan and enough water to cover it plus an extra 2 cups, or so. Boil it until it’s done (no longer pink) and use a food processor, potato masher or whatever and mash it all up. Each of our dogs gets about 1/2 cup of this added to his regular kibble, two or three times a week. Toss on an egg, 1/2 cup of yogurt or cottage cheese, a teaspoon of garlic and a tablespoon of salmon oil (other fish oil can be substituted, but mine LOVE salmon oil) and mix it all up with the kibble. We don’t always add all of the ingredients, just what happens to be in the kitchen, but when we serve kibble with “puppy primer” there is not a bowl in the house that’s not licked clean. Many people don’t like to change their dog’s diet, but we’ve very seldom had any problems with it, except with one of the dogs who is extremely lactose intolerant (she does NOT get any of the cottage cheese, even though she loves it). If you think about it, up until just 20 or so years ago, many dogs ate table scraps for dinner and most of them lived on that pretty well, even though it meant they ate something different every night. Changing foods didn’t cause them digestive problems and it probably won’t mess with your hunting dog’s tummy either. Just to be on the safe side though, I wouldn’t wait until the night before a hunt to change their food around. Having a diet that gives him all the nutrients he needs will never make a badly trained hunting dog great. On the other hand, even a truly great hunting dog who isn’t getting the nourishment he needs won’t be performing to his full potential.